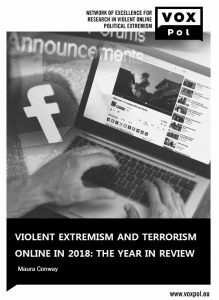 VOX-Pol has released its Violent Extremism and Terrorism Online in 2018: The Year in Review today, authored by Professor Maura Conway. This is the third publication in the Year in Review series following the Year in Review 2017 and the Year in Review 2016. This report treats developments in the violent extremist and terrorist online scenes in the 12-month period from 1 December 2017 to 30 November 2018. It is divided into three parts: Part I focuses on the online activities of violent jihadis, particularly the so-called ‘Islamic State’; Part II supplies information on contemporary extreme right online activity, and Part III identifies issues in the violent extremism and terrorism online realm that bear watching in 2019. In terms of overarching trends, the focus of policymakers, internet companies, media, and thus also the public has, since 2014, been almost exclusively on IS’s online activity. A growing concern with extreme right activity, both its online and offline variants, began to be apparent in 2017, especially in the wake of events in Charlottesville. This solidified in 2018 due to a number of factors, including a decrease in IS terrorist attacks in the West and an uptick in extreme right and hate attacks and terrorist events, a number of the latter of which appeared to have significant online components. Having said this, IS is still active on the ground in numerous locales globally and continues to produce and widely disseminate online content, as do a large number of other groups that share core tenets of its ideology. IS may be down, but it is certainly not out.